Pergamon Acropolis: remains of the Temple of Dionysus on the north side of the theatre. Dionysus, the god of wine, ecstatic revelry and the theatre, patron of actors , was one of the most important deities in Pergamon, along with Athena, Zeus, Demeter and Asklepios. 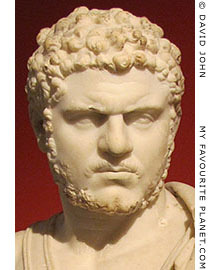 The Attalid kings claimed descent from Dionysus Kathegemon (the god who leads), as well as from Herakles. Eumenes II (Εὐμένης Β' τῆς Περγάμου, ruled 197-159 BC) was such an enthusiastic supporter of the cult that he had two temples built for the god on the Pergamon Acropolis. The Temple of Dionysus Kathegemon was built at the foot of the theatre's cavea (seating area), at the north end of a 246.5 metre-long, 17.4 metre-wide colonnaded terrace (see the photo of a model of the Pergamon Acropolis on gallery 1, page 4). A 4.5 metre high stairway of 25 marble steps led up to the temple, which was 13.17 metres wide and 21.6 metres long. It had a porch at its entrance (prostyle), supported by four Ionic columns (tetrastyle), with a further column behind each of end columns. Each of the columns was over 11 metres tall and 1.13 metres in diameter. It appears that the temple was never quite completed, and that a frieze planned for it was also unfinished. This may have been due to the fact that the sculptors were busy on several other of Eumenes' building projects, including the enormous Great Altar of Zeus. The Great Altar itself proved so ernomously expensive to build, that Eumenes' sucessor Attalus II Philadelphus apparently called a halt to construction in 159 BC, before its completion . The steps, foundations and scattered remains can still be seen in situ, and although it does not seem very big, it was the largest prostyle temple built in the Hellenistic era. The temple was damaged or destroyed by fire during Roman times, and Emperor Caracalla (188-217 AD, ruled 198-217 AD) had it rebuilt. 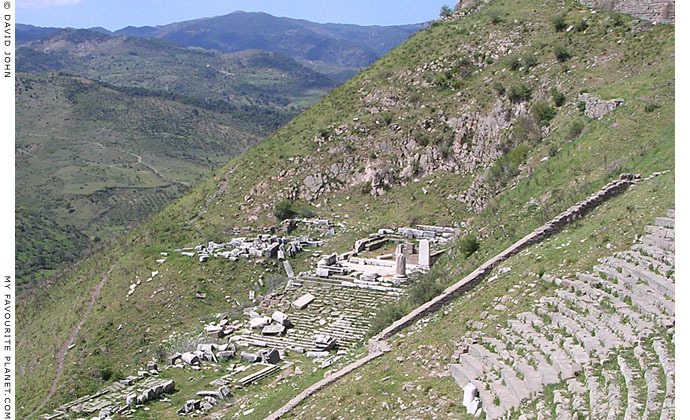 An older sanctuary of Dionysus with a Doric temple and a banqueting hall, probably from the time of Pergamon's first Attalid ruler Philetaerus (Φιλέταιρος, circa 343–263 BC), was at the east of the citadel, just outside its defensive walls, next to a temple of Demeter. The mystery cults of these ancient harvest deities were related. It is thought that the old sanctuary of Dionysus was destroyed along with many other buildings outside the citadel in 201 BC, during the siege by Philip V of Macedon. The destruction caused by this siege created the impetus for a reorganization of the city, its building plan and defenses. Eumenes II commisioned the famous architect Hermogenes of Priene (Ερμογένης, late 3rd - early 2nd century BC) to build a new temple of Dionysus on the site. The new temple, known as "Temple R of Dionysos", was Ionic and its design is considered to have been innovative. Because of similarities between "Temple R of Dionysos" and the Temple of Dionysus of the Pergamon theatre, it has been conjectured that Hermogenes also designed the latter. Hermogenes also built the largest temple of Dionysus in the ancient world at Teos (Τέως) in Ionia , with which Pergamon kept close relations, including an association between the theatre groups of the two cities. a statue, mid 2nd century AD. 1. 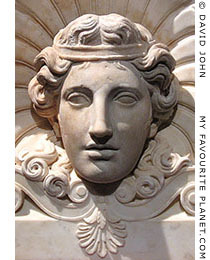 For further information about Dionysus and photos of depictions of the god, see the Dionysus page of the My Favourite Planet People section. 2. See Fatih Cimok, Pergamum, pages 34-35. A Turizm Yayinalari, Istanbul, Turkey. Third edition, 2009. 3. Teos (Τέως) in Ionia, at the village of Sığacık, near Seferihisar, southwest of Izmir (ancient Smyrna). Not to be confused with Tios (Τίειον), birthplace of Philetaerus, in Paphlagonia (or Bithynia) on the Black Sea. The ancient seaport Teos, famous for its wine, was one of the twelve cities of the Ionian League, an important centre of the Dionysus cult, and home of the powerful guild of actors and performers who played at the cities of Asia, such as Pergamon, and the Aegean islands. Teos was also the birthplace of the poets Anacreon and Scythinus, the sophist philosopher Protagoras, the historian Hecateus, the geographer Andron and Apellicon who preserved the works of Aristotle. The remains Teos are between the town of Seferihisar and Sığacık village, on the south coast of the Çeşme peninsula, one hour southwest of Izmir and half an hour northwest of Selçuk and Ephesus.